SWEET BELL PEPPER: Bell peppers have a rounded, square shape with four lobes. They are hollow, with flat seeds inside. Bell peppers are the most commonly grown type of pepper in North America. 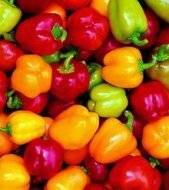 Most bell peppers are harvested when they are still green, but when left to mature on the plant for a longer length of time, some peppers will turn shades of red, yellow or even purple.